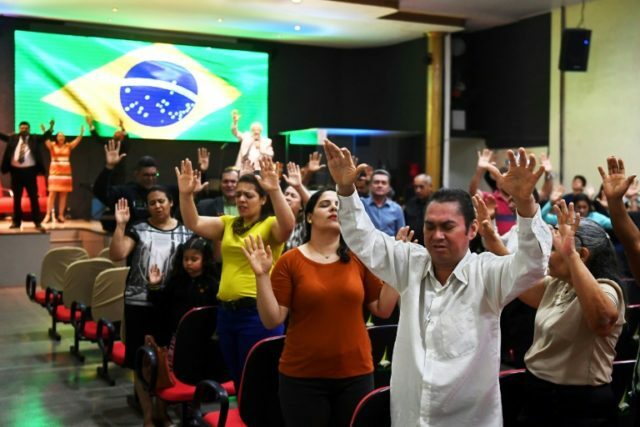 Brasília (AFP) – Jair Bolsonaro may be the most hated candidate standing in Brazil’s presidential elections, but his popularity is soaring among the growing evangelical Christian community. “Bolsonaro represents really well our conservative ideals with regards the family and Christian principles,” said pastor Alfeu Gebrin of the right-wing candidate, who was stabbed in the abdomen by a left-wing activist while campaigning earlier this month. “Almighty Lord, visit him in hospital where he is and restore his strength,” added Gebrin to an energetic chorus of “Hallelujah!” from his congregation at the Assembly of God church in Brasilia. Bolsonaro may be convalescing in the hospital but the attack hasn’t hurt his chances of getting elected. The opinion poll frontrunner has seen his share grow since his knife-attack ordeal, although his rejection figures remain a constant of around 40 percent, higher than any other candidate in the October 7 election first round. In the latest poll taken by Datafolha, Bolsonaro led with 28 percent ahead of leftist candidate Fernando Haddad on 16. But among evangelicals, he was streaks ahead: 36 to 12. The 63-year-old ex-army captain may be branded racist, misogynist and homophobic by his detractors, but he’s untouched by the corruption scandals that have affected many politicians, while his tough-on-crime discourse and traditional values have seduced many. “He thinks like a Christian, defends the traditional family, is against abortion and gender ideology,” said Ulisses de Almeida, a 40-year-old member of the Assembly of God congregation, where believers pray for the future of Brazil — and Bolsonaro’s health. “He’s an honest candidate. After all the corruption of the last few years, that’s a factor that weighs heavily,” added De Almeida, who is also a pastor. It does for Maria Aparecida Santana, a 36-year-old teacher who previously voted for ex-president and leftist icon Luiz Inacio Lula da Silva. But now that he’s serving a 12-year sentence for taking a bribe, she won’t be backing his Workers’ Party substitute, Haddad. This time she will vote for Bolsonaro, “despite all the controversies” over his comments, including expressing admiration for the 1964-85 military dictatorship’s use of torture. Such opinions are “insignificant” next to what really matters, according to Santana: improving family life and security. Having the backing of the country’s rapidly-growing evangelical community is not insignificant. Although Brazil has the largest Catholic population in the world, evangelicals increased from 15 percent in 2000 and 22 percent 10 years later, according to the Geography and Statistics Institute, to 29 percent in a 2016 Datafolha poll. Evangelicals are well-represented in parliament too, with three out of 81 senators and 81 out of 513 deputies. And according to Josimar da Silva, president of the Federal District Council of Evangelical Pastors, they’re well-drilled and work hard to maintain “a strong, organized bench that can put the brakes on actions against the church,” such as initiatives to legalize abortion or gay marriage, that was permitted in 2014 by a Supreme Court order. Evangelical pastors hold a lot of sway amongst the faithful, to the point of being asked for voting advice. The rise of evangelism is accompanied by an increase in conservatism in Brazil and around the world, says anthropologist Ronaldo Almeida from the Campinas State University in Sao Paulo. Politically, that conservatism is represented by the “bullet bench” in Congress, made up of ex-military and police deputies in favor of legalizing gun ownership, as well as the rural bench that defends farming interests. It’s “to a great extent a reaction to great progress in the field of morals” such as increased visibility for the LGBT community, discussions about gender or gay marriage, says Almeida. And Bolsonaro’s candidacy is boosted by “the corruption scandals, violence, crime that generate a desire for order and authority,” added Almeida. Even so, there remain many evangelicals as turned off by Bolsonaro as those from other sectors of society, with 35 percent saying they would never vote for him, albeit less than the 40 percent he averages nationally in that respect. “Evangelical representatives in politics don’t necessarily translate the discourse of their flocks into their everyday lives,” though, says sociologist Eurico Cursino. They tend to behave with greater tolerance there. As would Bolsonaro, according to De Almeida, who insists the hard-right candidate would “govern for all” if he wins.